Fans of the Marvel movie universe will get a kick out of this... TV Guide has posted a first-look image of at the season two premiere of Agents of SHIELD, and it looks like we'll be seeing Kenneth Choi reprising his role as World War II soldier Jim Morita from Captain America: The First Avenger. First Look: Haley Atwell's Agent Carter on Marvel's Agents of S.H.I.E.L.D. 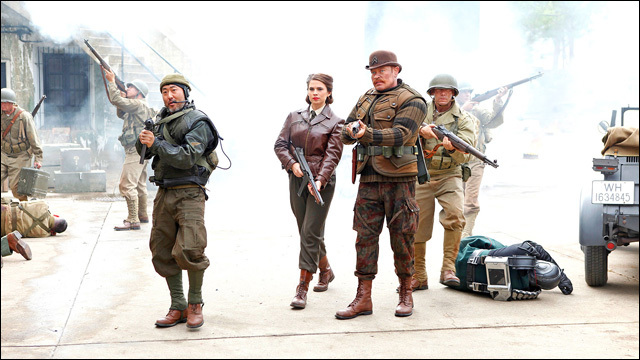 The photo features Choi alongside his Captain America cast mates Hayley Atwell as Peggy Carter and Neal McDonough as Dum Dum Dugan, in what is likely a 1940s era flashback sequence to beginnings of SHIELD. Morita fought as part of an elite special unit of Allied soldiers called the Howling Commandos. 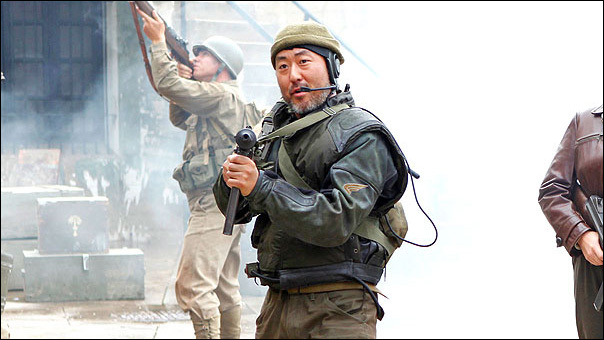 As a photo first revealed by TV Guide Magazine shows, Howling Commandos Dum Dum Dugan (Neal McDonough) and Jim Morita (Kenneth Choi) will pop up alongside Carter in a flashback to the 1940’s. Before now, we weren’t sure whether Carter would appear in the past or in the present, as she did in Captain America: The Winter Soldier. Much of S.H.I.E.L.D. 's second season is shrouded in mystery, but it’s safe to say the premiere, “Shadows,” will also help to prime audiences for Agent Carter, which will air during S.H.I.E.L.D. 's midseason break this winter. He looks pretty badass in this photo, though I'm guessing his appearance in the sequence is pretty brief. However, that doesn't necessarily mean we won't be seeing more of Jim Morita in this universe. The spinoff series Agent Carter, which follows the continuing post-war adventures of Peggy Carter, is set to air next year. Wouldn't it be great to see Kenneth Choi as part of that ensemble? Season two of Agents of SHIELD premieres September 23 on ABC.